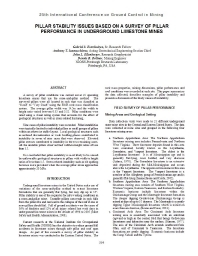 A survey of pillar conditions was carried out at 21 operating limestone mines that use the room-and-pillar method. The surveyed pillars were all located in rock that was classified as "Good" to "Very Good" using the RMR rock mass classification system. The average pillar width was 14.5m and the width to height ratio varied between 0.53 and 3.52. Pillar conditions were rated using a visual rating system that accounts for the effect of geological structures as well as stress related fracturing. Nine cases of pillar instability were recorded. Pillar instabilities were typically limited to individual pillars or small groups of pillars within an otherwise stable layout. Local geological structures such as inclined discontinuities or weak bedding planes contributed to instability in seven of nine cases that were observed. Elevated pillar stresses contributed to instability in the two remaining cases. All the unstable pillars observed had width-to-height ratios of less than 1.5. It is concluded that pillar instability is most likely to be caused by unfavorable geological structures in pillars with width to height ratios of less than 1.5. Stress related instability such as rib spalling becomes more prevalent when the average pillar stress approaches approximately 20 MPa.